Bishops Stortford & Epping Taekwon-do: English Championships 2018. We took 14 student to the English Championships on 25th March with well over 1,000 students competing overall. We came home with 1 Gold and 3 Silver trophies. Christine Abbott: Ladies black belt lightweight sparring and patterns. Michael Barford: Black belt Executive sparring and patterns. Colin Mowatt: Black belt breaking and patterns. 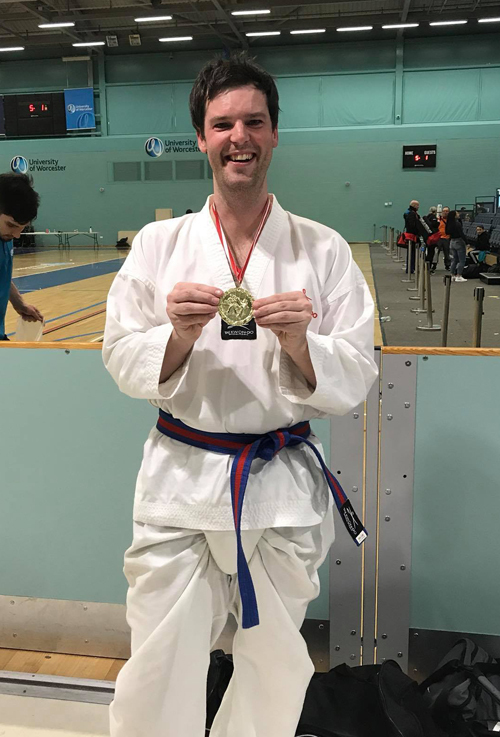 Will Mendham: Black belt breaking and patterns. Suzanne Wolfe: Black belt ladies patterns. Alex Ion: Boys yellow belt Patterns. Lee Pocklington: Mens Blue belt Heavyweight sparring. Robert Anderson: Boys yellow belt middleweight sparring and patterns. Sebastian Clarke: Boys blue belt lightweight sparring. Josh Deller: Cadets Blue belt lightweight sparring. Madi Park: Girls Yellow belt patterns. Tony Park:Men Executive Blue/red belt heavyweight sparring and patterns. Isaac Manning; Boys blue belt patterns. Josh won Silver in Cadet lightweight blue belt sparring. He narrowly lost in the final after 3 extensions. Gabriel won Silver in Boys yellow belt heavyweight sparring. win the final losing by a narrow margin. Christine won a well deserved Silver in an excellent women’s black belt patterns division. Lee was the last to medal with a Gold in Team Blue/red heavyweight sparring. A special well done to Sebastian Clark who won through 2 rounds of sparring in his first ever competition just missing out on a trophy. Umpire duties were performed by Suzanne Wolfe, John Anderson and Angie Mitchell.